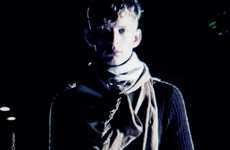 World renowned photographer Pierre Debusschere released a jarring video journey entitled 'Blind Strobe.' The minute and a half film features models Robert Sheehan, William Eustache and Armin Ibrisimovic, to name a few. Debusschere has made his mark in the photography world by shooting covers for Vogue and many high-end designers. His latest venture is disturbingly beautiful. Stop motion photography, mixed with aberrant imagery, makes 'Blind Strobe' a memorable artistic piece. Implications - The strobe light effects in the video work magnificently to exude an ominous and eerie feeling, which is only punctuated by the rhythm of the drums and the creepy voice over. The video builds until a calming note washes over viewers, providing a cathartic experience. Truly a work of art in video form.